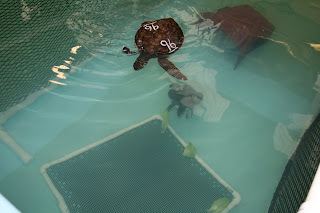 We currently have 5 green sea turtles in rehabilitation at our facility, and they deserve some special treatment. The greens get fed something special, but they also are on diets...already! Above, 'Hercules' (#13) was being looked at during his scheduled physical exam. He is a great eater and has been gaining weight fast. 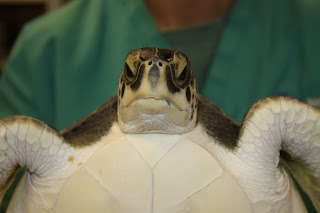 He has been placed on a diet (along with the other green sea turtles) so that his weight gain isn't too excessive. 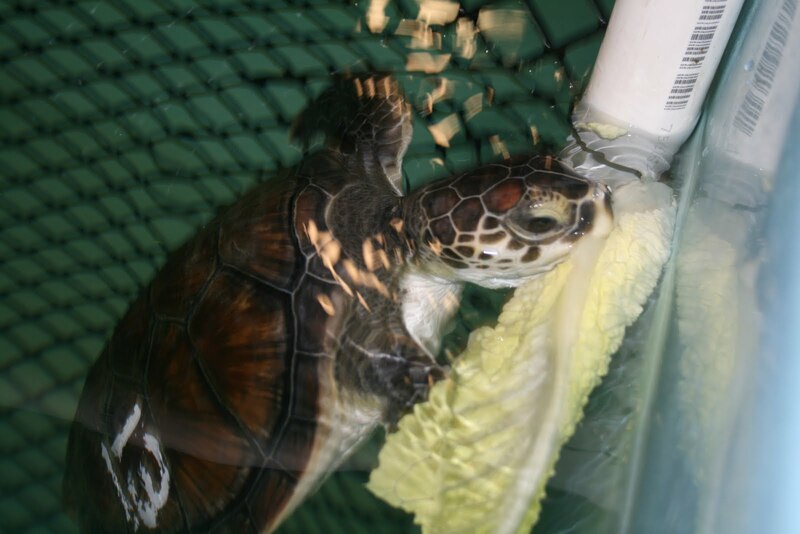 We use a special calculation to determine how many calories these turtles should be eating, and they usually aren't happy about having a food limit! 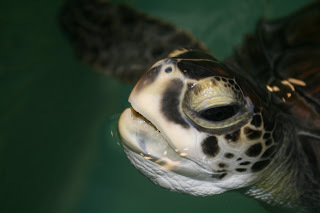 The diet of green sea turtles is different from the other species we have because they eat vegetation. In the above photo of 'Hercules', you can see his serrated jaw. This adaptation allows this species to tear the vegetation, while the Kemp's ridleys have more of a crushing jaw (to eat crabs). We offered the greens some romaine lettuce the past few days in addition to their regular diet of herring and squid. Initially, I just put a couple lettuce leaves in the tank. The only turtle interested in the lettuce was 'Hercules'. He started chowing down immediately! We then put the lettuce forest, as we call it, in the tank. You can read about the first use of the lettuce forest here. Usually we fill up the contraption with lettuce for the turtles to eat and swim in, which provides some enrichment while acting as an anchor for their nutritional supplement. All the other turtles except 'Hercules' stayed as far away as possible. #96 eventually got slightly curious and hovered near the lettuce forest, but he hasn't attempted a bite yet. I'm sure they'll come around eventually, especially once they realize it's something to eat! In the meantime, 'Hercules' is having a blast having all the lettuce to himself.